Vietnam was one of the countries that I wanted to visit for a variety of reasons. There’s the little things in Vietnam that takes time to it used to, such as the way of crossing the street and buying train tickets that can be helpful to know before you go. Checkout our travel guide to Vietnam before going. But it’s important to be prepared, you’ll get the most out of it by learning all you can before you arrive and learning from my experiences visiting Vietnam. 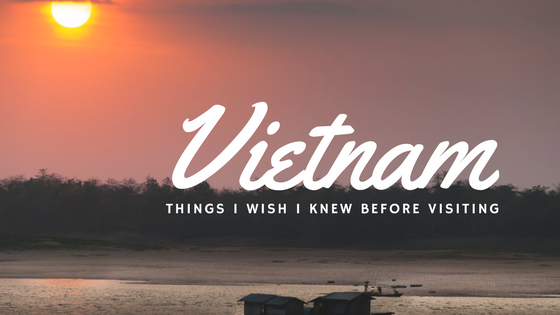 Here are 9 Vietnam travel tips, that I wish I knew before visiting Vietnam. I am putting this here even if it seems like common sense. Unlike other countries in South East Asia, where you can turn up and get stamped a tourist visa. In Vietnam you need to apply for the single entry visa. Check latest visa requirements with your nearest Vietnamese embassy. It costs $17 and took 4 days to get the letter. Also bring 2 passport photos and a printed copy of the letter. The single entry visa costs another $25 to get stamped. This happens all over Vietnam but particularly Hanoi. The Vietnamese drive and park their mopeds on the footpaths. This makes walking along the footpath at best very challenging, particularly when rogue mopeds mount the curb when the traffic on the road gets too heavy. To cross the street is a challenge at best of times. In truth it’s total chaos with the never-ending sea of cars, mopeds and motorbikes. Generally the rules of the road are not enforced or obeyed. Traffic lights and pedestrian crossings are ignored by drivers. Traffic isn’t going to stop for you to cross the street. You just have to go for it and just walk at a normally pace (Not to stop or suddenly run ) and trust traffic will swerve around you. The dong, is the Vietnamese currency. There is two things to get used to. The first is the conversion rate 26,610 VND equivalent to 1 euro. With the long numbers can make conversions in your head hard. For example at a restaurant with friends and the final bill came to 1,314,610 VND. Try converting that in your head. The second is the zeros on the Vietnamese dong. You will need to double-check the notes and count the zeros. The notes have different colours but the 10,000 dong note looks like the 100,000. You will need to get familiar with the notes. The toilets are not the best in some cases pretty awful. The public toilets are used by everyone and there are not regularly maintained, expect to be shocked. If in rural areas, there’s no avoiding the squat toilet. 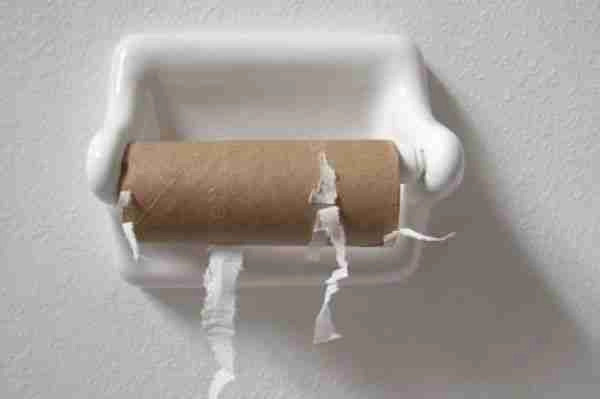 Remember, to always begin a toilet roll with you everywhere in Vietnam. If you don’t remember any of the above Vietnam travel tips, this one I would advise to remember. You will be grateful. The train and the overnight is a great way to get around Vietnam. It’s also a great way to see the Vietnamese countryside. If your buy your train tickets online or from an agent even your hotel, it can cost double the price of the actual train. As they charge a substantial service fee. This also applies for bus tickets bought online or from an agent. For train tickets, they do tend to sell out days in advance, so don’t go to the train station with no ticket expecting to hop on the next train. Go to the train a day or two before your plan to and get a ticket. Even when you first day of arriving, buy the train ticket. Expect trips to than longer than claimed. My trip from Hanoi to Da Nang by train was supposed to be about 16 hours, it ended up closer to 18 hours. The accurate of the travelling times from A to B in Southeast Asia is normally incorrect. This applies to buses as well. Be prepared, for longer than planned trips. Plan your trip, these is a lot of places to see. And when travelling around Vietnam and moving from A to B. You start to realise its a big country. A train from Hanoi to Ho Chi Minh City/ Saigon takes about 34 hours. Where as a flight is over 2 hours. It took 4 hours via bus to arrive to Halong Bay from Hanoi. The beaches may not be anything like Thailand so you might be little disappointed. The Pacific coastline is rocky and rough, but Vietnam has nice beach towns like Hue. With Vietnam its more culture than beaches destination. Once you visit Vietnam, you will have plenty of options to visit, explore, discover and with so many things to do in Vietnam and with these Vietnam travel tips, will make your trip even more enjoyable. But like any trip, you’ll get the most out of it by learning all you can before you arrive. Hope these Vietnam travel tips are helpful, if I missed anything please leave a comment. And that’s it for now! 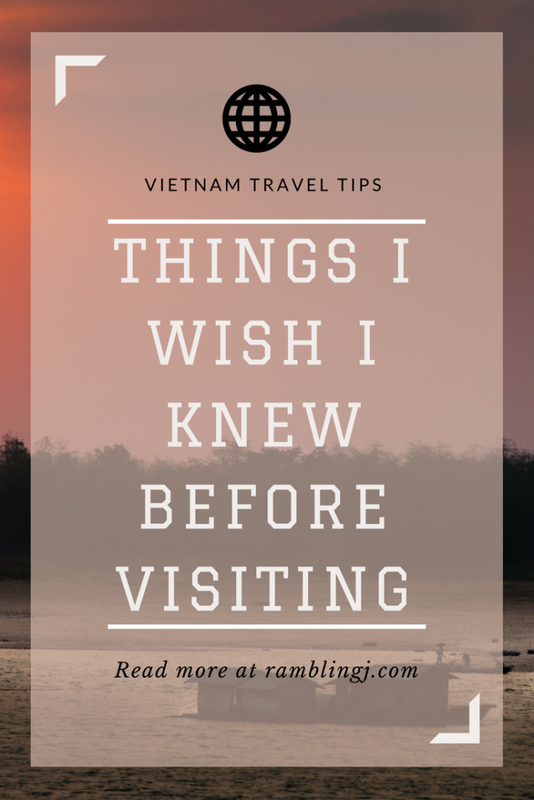 I’d love to know if this guide on Vietnam travel tips has helped you. Let me know if you have any questions and let me know if you go too.